Liverpool FC is backing a new campaign that encourages fans to respect the local area when visiting Anfield. 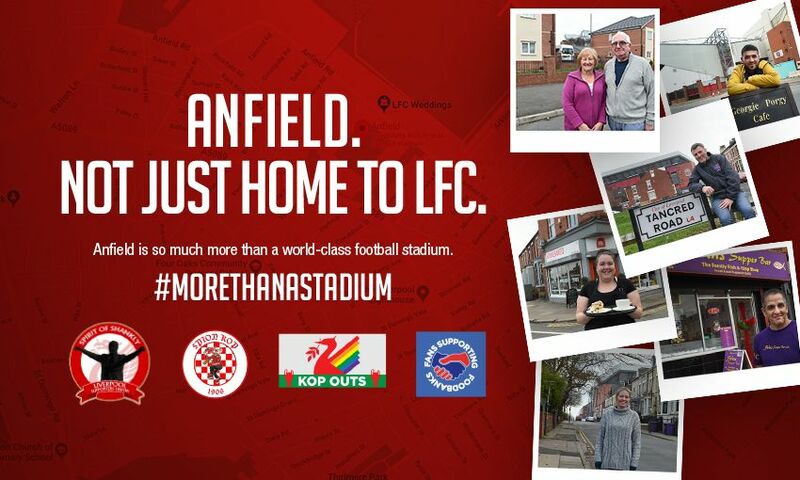 Led by supporters’ groups Spirit of Shankly, Spion Kop 1906, Kop Outs and Fans Supporting Foodbanks, the ‘#morethanastadium’ initiative aims to encourage fans and visitors to respect the neighbourhood and its residents when attending matches or visiting the stadium. Ian Byrne, Fans Supporting Foodbanks co-founder, said: “The idea behind this initiative is a simple one reflected in the hashtag #morethanastadium. “It is a grassroots, supporter-led campaign backed by fan organisations and it simply asks all supporters to always remember that the Anfield/Everton area is home to many residents and businesses, who are equally as important to the fabric of our community as any player. The club has committed to working in the local area to help improve street cleanliness and reduce anti-social behaviour and is working with Liverpool City Council to assist with parking enforcement and other prominent issues. Andy Hughes, chief operating officer at LFC, said: “Thousands of residents live in and around Anfield’s immediate vicinity, alongside many local businesses, and it’s important to remember that it’s not just our home - it’s theirs too. “As part of our ongoing commitment to the local community and our neighbours, we have been working hard in recent months on various issues that local residents have identified to us, particularly with regards to our matchday operations and the impact on the local area.